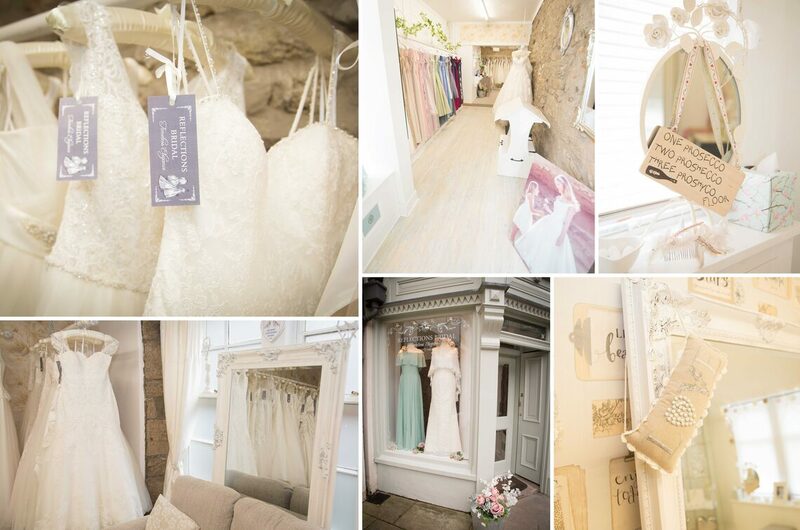 Reflections Bridal Boutique is situated at number 18 Bridge Street, Kelso. It is said that Sir Walter Scott thought Kelso ‘the most beautiful, if not the most romantic town in Scotland'. It is therefore befitting that we should have our beautiful boutique here in this thriving market town. Here at Reflections Bridal, we are passionate that your Wedding Gown should be an extension of your personality - a reflection of your inner self. We understand that your perfect dress is such an individual and personal expression of you, ‘The Bride’. With over 10 wonderful years experience in Bridal, our friendly atmosphere will make your Dress buying experience with us an enjoyable one. Above all, we wish for you to have fun and feel relaxed. Every Bride is made welcome with a glass of cold bubbly or if you prefer tea and coffee. We take time to discuss with you your Wedding plans so that we get an insight into the type of wedding you have dreamed of. Every Bride we meet is fabulously different but with one common aim; to find the most important Dress they will ever wear. We are passionate that no two Brides should ever look the same and we go to great lengths to ensure each Bride has the look of individuality she so deserves. With our many years of experience and a keen eye for detail, we will advise on which styles are best suited to every Bride from size 0 to size 30. Every Reflections Bride is beautiful! We have a stunning collection of Wedding Gowns and Occasion Dresses from four amazing Bridal Designers; Ellis Bridal, Phil Collins Bridal, Lis Simon and Wendy Makin. Whether your style is Vintage, Traditional or Modern Chic, we are sure you will be impressed with the many styles we have to Wow you with. And for the Bridesmaids; Dessy, Bari Jay and Angel B giving you choice from over 80 different styles and fantastic choice of colours. Reflections Bridal Boutique are proud members of the British Bridal Retail Association (BBRA). As well as knowing you are purchasing your Wedding Gown with one of the best Bridal retailers in the Borders and Northumberland, being a BBRA member also means we are able to offer our Brides the BBRA’s “Buy with confidence” Brides Protection Scheme. This gives our Brides FREE Bridal Gown Insurance that protects your Deposit and your Gown. We recommend that you book an appointment with us to avoid disappointment. However, as we appreciate spontaneity can be wonderful, if we are free then we are more than happy to see you. We accommodate one bride at a time to ensure you have our undivided attention. Many of our Brides arrive as customers and leave us as friends - we look forward to sharing your journey!